Mindfulness training has been shown to improve health and well-being. It has also been found to be effective for a large array of medical and psychiatric conditions, either stand-alone or in combination with more traditional therapies. As a result, mindfulness training has been called the third wave of therapies. One problem with understanding mindfulness training effects is that there are, a wide variety of mindfulness techniques and it is not known which work best for improving different conditions. There are a number of different types of meditation. Many can be characterized on a continuum with the degree and type of attentional focus. In focused attention meditation, the individual practices paying attention to a single meditation object, learns to filter out distracting stimuli, including thoughts, and learns to stay focused on the present moment, filtering out thoughts centered around the past or future. In open monitoring meditation, the individual opens up awareness to everything that’s being experienced regardless of its origin. These include bodily sensations, external stimuli, and even thoughts. These techniques have common properties of restful attention on the present moment, but there are large differences. These differences are likely to produce different effects on the practitioner. One way to distinguish between the effects of these different meditation techniques is to observe the effects of each technique on the brain. In today’s Research News article “Common and Dissociable Neural Activity After Mindfulness-Based Stress Reduction and Relaxation Response Programs.” (See summary below or view the full text of the study at: https://www.ncbi.nlm.nih.gov/pmc/articles/PMC5976535/ ), Sevinc and colleagues recruited adults and randomly assigned them to receive 8 weekly 2-hour group sessions with 20 minutes of daily home practice with guided recordings of either a Relaxation Response program or a Mindfulness-Based Stress Reduction (MBSR) program. In the Relaxation Response program, the participants practiced a body scan with emphasis on relaxation and focused meditation on the breath in a 20-minute session. In the MBSR program the participants practiced body scan with focus on awareness of the sensations from the body for 2 weeks, yoga for 2 weeks, and open monitoring meditation for 2 weeks. The last 2 weeks the participants could chose whichever of the practices they wanted to perform. They were measured before and after training for perceived stress, mindfulness, self-compassion, rumination, and life stressors. They also underwent Magnetic Resonance Imaging (MRI) while they listened to a guided recording for the body scan from their home practices. They found that both practices equivalently reduced perceived stress and increased mindfulness. But the Mindfulness-Based Stress Reduction (MBSR) program also significantly increased self-compassion and decreased rumination. Interestingly, although both practices produced increases functional connectivity between the prefrontal cortex and motor cortex, the two practices also produced different connectivities. When the body scan was practiced with emphasis on relaxation there was increased functional connectivity was with the right inferior frontal gyrus. This is an area that’s involved in behavioral inhibition. On the other hand, when the body scan was practiced with emphasis on awareness of sensations there was increased functional connectivity between the Insula and Cingulate Cortex, areas associated with sensory awareness. Hence, although both practices were beneficial, the MBSR program appears to create better psychological well-being. In addition, the body scan technique used in the MBSR program, emphasizing sensory awareness, appears to increase the connectivity between brain areas that are involved in sensory awareness. On the other hand, a relaxation instruction with the body scan appears to produce increased brain systems devoted to restraining responses. Different mindfulness techniques produced different psychological and neural outcomes. Both appear to improve stress responding and mindfulness, but the MBSR program also produces better compassion for the self and less repetitive negative thinking, rumination. So, there may be a place for the relaxation response program, but with these otherwise healthy adults, the Mindfulness-Based Stress Reduction (MBSR) program appears to produce superior results. 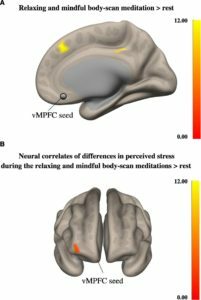 We investigated common and dissociable neural and psychological correlates of two widely used meditation-based stress reduction programs. Participants were randomized to the Relaxation Response (RR; n = 18; 56% female) or the Mindfulness-Based Stress Reduction (MBSR; n = 16; 56% female) programs. Both programs use a “bodyscan” meditation; however, the RR program explicitly emphasizes physical relaxation during this practice, whereas the MBSR program emphasizes mindful awareness with no explicit relaxation instructions. After the programs, neural activity during the respective meditation was investigated using functional magnetic resonance imaging. Both programs were associated with reduced stress (for RR, from 14.1 ± 6.6 to 11.3 ± 5.5 [Cohen’s d = 0.50; for MBSR, from 17.7 ± 5.7 to 11.9 ± 5.0 [Cohen’s d = 1.02]). Conjunction analyses revealed functional coupling between ventromedial prefrontal regions and supplementary motor areas (p < .001). The disjunction analysis indicated that the RR bodyscan was associated with stronger functional connectivity of the right inferior frontal gyrus—an important hub of intentional inhibition and control—with supplementary motor areas (p < .001, family-wise error [FWE] rate corrected). The MBSR program was uniquely associated with improvements in self-compassion and rumination, and the within-group analysis of MBSR bodyscan revealed significant functional connectivity of the right anterior insula—an important hub of sensory awareness and salience—with pregenual anterior cingulate during bodyscan meditation compared with rest (p = .03, FWE corrected). The bodyscan exercises in each program were associated with both overlapping and differential functional coupling patterns, which were consistent with each program’s theoretical foundation. These results may have implications for the differential effects of these programs for the treatment of diverse conditions.